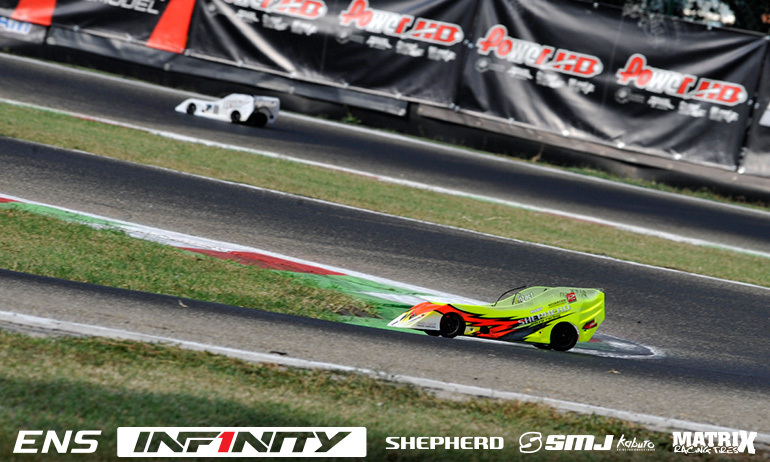 Simon Kurzbuch will defend his Euro Nitro Series title tomorrow at the Season Finale in Italy from pole position. 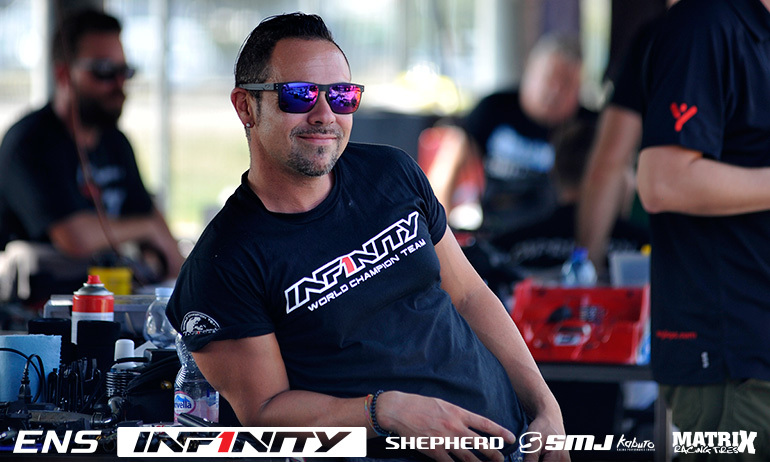 The Shepherd driver made it a clean sweep of qualifying for the 2018 season as he wrapped up his fourth TQ from the championship’s four races. 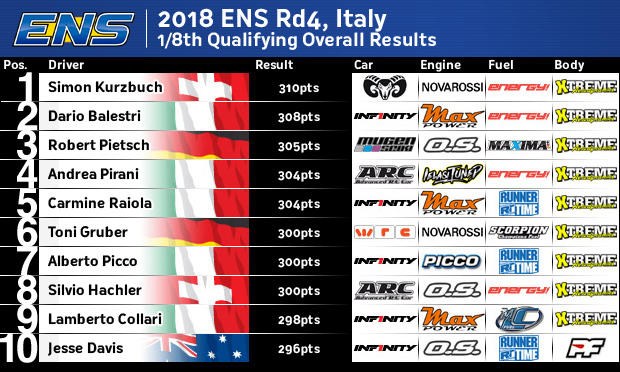 Having suffered a broken front belt in Q3 and title rival Dario Balestri getting the TQ for that round, Kurzbuch had to wait until the final round to bag himself the extra championship point which could prove vital at the end of tomorrow’s 45-minute final. He took the final qualifier ahead of Robert Pietsch and Toni Gruber after a hard pushing Balestri had a mistake in the second half of the qualifier. The Italian will start 2nd with Pietsch third while Andrea Pirani makes it four different manufacturers at the head of the grid. 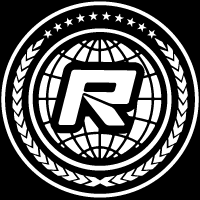 Kurzbuch’s TQ today eliminates Gruber from the title fight, the WRC driver at best being able to equal the leaders points tally with a win but losing out on the tie break. Between himself and Balestri, however, if the Italian wins he must be sure to finish on the podium with a 3rd place giving him his 3rd consecutive title on tie break with the only driver who has previously denied him becoming champion. 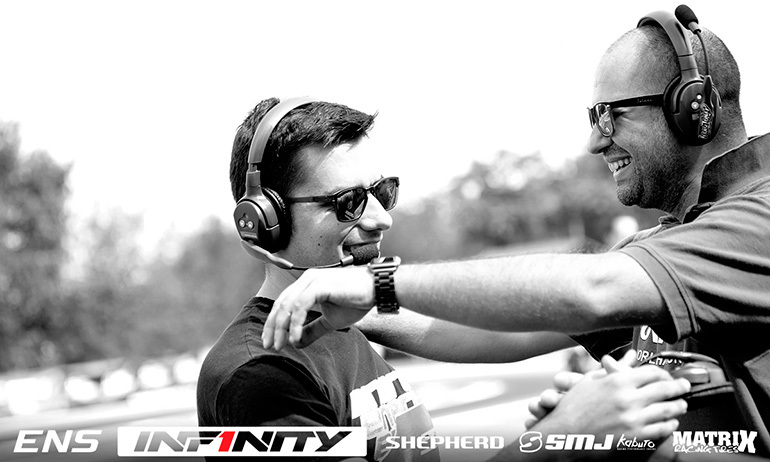 Reacting to what would be the slowest of his three TQ runs this weekend, Kurzbuch said, ‘It was a really good run. We used the engine we have for the final and the feeling was really good. We got good knowledge about fuel consumption’. 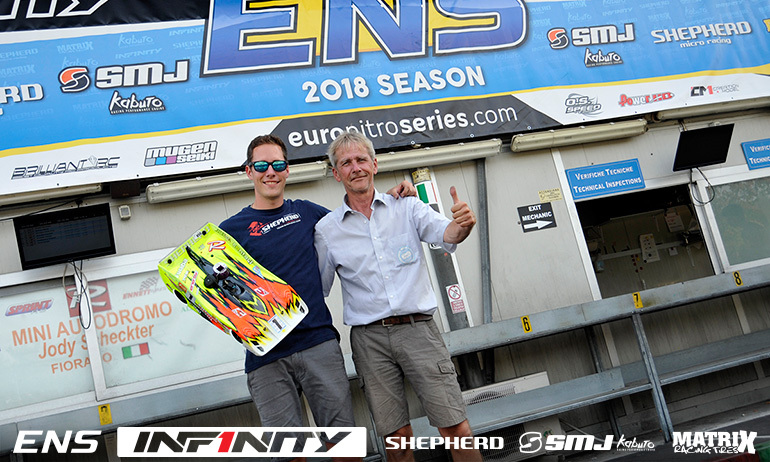 Chasing his 11th ENS career win from his 12th TQ starting position, he added, ‘now we will prepare the car so we don’t have any issues tomorrow’ – his belt failure a rare mechanical fault for the Swiss driver. He continued, ‘to get all four TQs this season compensates for the Rucphen and Ettlingen results’. Asked about strategy for the final he replied, ‘the tyre wear is surprisingly low compared to other years so there will be less stops than before’. On fuel he said, ‘we are quite fast on lap times so it is quite high but it is the same for the Top 5 drivers. I hope we have a clean final tomorrow. We are looking to bring home the overall title not the win but if there is a chance of course we will go for the race win too’. 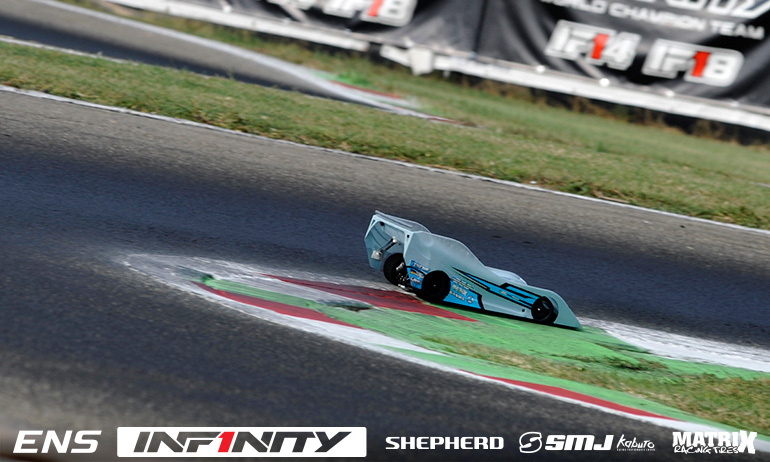 Balestri said, ‘I needed a 4:12/13 time to make the TQ so I had to push and made a mistake. I had nothing to lose’. The Infinity driver continued, ‘from one side I am a bit disappointed. I had a lot of traffic and this cost me the TQ already this morning. On the other side it is interesting to start behind Simon. I can follow him and make pressure’. The World Champion concluded, ‘we have a lot of speed and we can fight for the win’. Commenting on his final qualifier which secured him P3 on the grid, Pietsch said, ‘It was again a good run and the car was really good but still I have this little lack of power after 2-minutes’. He continued, ‘At the start I have the same power as Simon but in the last 2-minutes it drops just a little. I expect in the final this wont be an issue and we will be the same pace because it was the same at the Euros in qualifying and but in the final all was fine’. On the final, the former World Champion said, ‘Dario, Simon and myself are doing the same time between stops so its going to be a straight up race for the win and not a strategy race’. Pirani said, ‘I lost the third place (on the grid) in the last round but 4th is ok for me and for a long race it changes nothing’. A former ENS podium finisher, the ARC driver said, ‘in the third qualifying I got 2nd and the car was very good but for the last one I ran new tyres so the lap times on bigger tyres went down and I got P5 which cost me the position on the grid’. Asked about the final he said, ‘I am confident for tomorrow. I will think about possible set-up changes tonight and maybe test some things in the final practice but I am looking forward to a good race. In the 40+ class, newly crowned champion Arie Manten will go for the perfect campaign from pole position tomorrow. 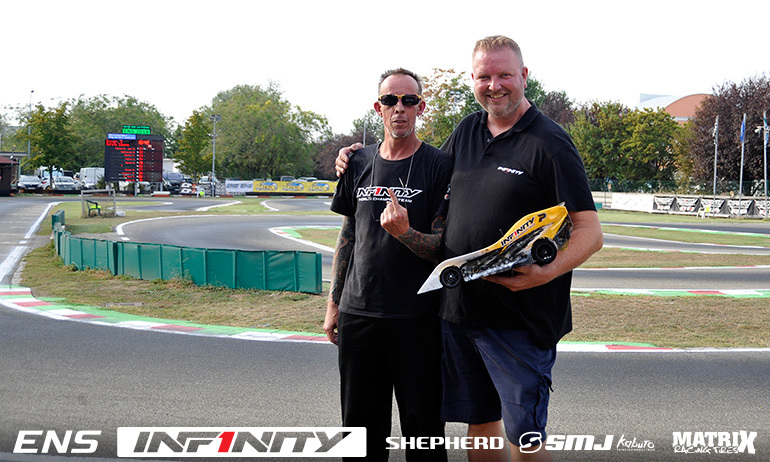 Like Kurzbuch, the Dutch driver secured his fourth TQ of the season and will start the 30-minute final ahead of fellow Infinity driver Bo Nielsen who TQ’d the final qualifier here in Fiorano. Andrea Hächler will start 3rd.